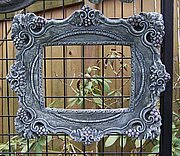 A407 Vine Frame Mirror 14 x 26 in. HD92 Owl Mirror 10 x 12 in. Leaf Frame 14.5 x 10 in. Small Frame 8 x 6 in. Y144 Frame accent 8 H x 5.5 in. Y166 Shakespeare Frame 7 in.